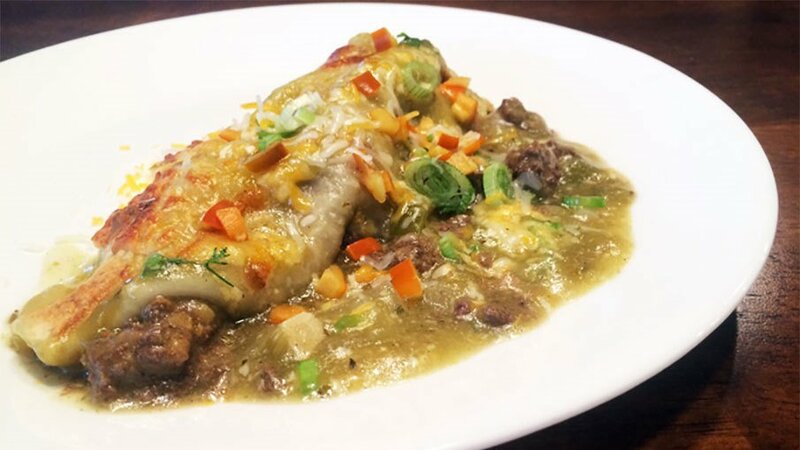 Just an easy enchilada recipe to make with all that leftover ground venison burger. Top these tasty enchiladas with diced green onion, red chilies, cilantro and sour cream. 2. Heat large pan over medium-high heat. Add 1 tablespoon olive oil, onion and garlic and sauté until onion becomes translucent, about 4 to 5 minutes. Add green enchilada sauce and the salsa verde to the pan. Reduce heat to low and stir sauces and onion together. 3. Using a separate skillet, add remaining oil and heat to medium-high. Add ground venison and continue to cook until done. While cooking add cumin, garlic powder, chili powder, oregano and a pinch of salt. Remove from heat. 5. With a large spoon fill venison mixture in the center of each flour tortilla. Roll up the tortilla and place seam side down in a 12x8x2-inch baking dish. 6. Pour the enchilada salsa verde sauce over the tortillas and top with remaining cheese. Cover loosely with tinfoil and bake for 20 minutes. Remove foil and continue to bake until all cheese is 100 percent melted. Roughly 10 minutes. For more venison recipes, visit NevadaFoodies.com.